It's nice being your own publisher. Sure, I don't have the readership of the Citizen, but then again, I've got the ear of plenty of influential folks many of who probably don't read the Citizen. Last week the Citizen published an editorial critical of the Heart and Stroke Foundation's Health Check program. Not surprisingly a few days later there was a letter in the paper defending Health Check and this time, surprisingly, it was written by Stephen Samis, the Heart and Stroke Foundation's Health Policy Director. This was surprising to me in that usually it's Terry Dean, Health Check's Director, that gets to write the letters of defense (he's had to write quite a few over the past few years). Stephen I've met before. He seems like a genuinely nice guy (Terry may well be too). I saw him at a recent conference we both attended and while I wanted to chat with him, I couldn't think of a way to do so without raising his ire. Truly I've got nothing against the Heart and Stroke Foundation, or Stephen, or Terry, it's just that their Health Check program is an embarrassing circus-mirror reflection of a healthy eating front of package program and they should know better. 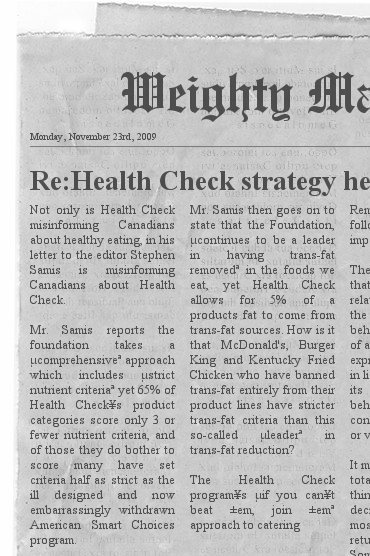 Not only is Health Check misinforming Canadians about healthy eating, in his letter to the editor Stephen Samis is misinforming Canadians about Health Check. Mr. Samis reports the foundation takes a “comprehensive” approach which includes “strict nutrient criteria” yet 65% of Health Check’s product categories score only 3 or fewer nutrient criteria, and of those they do bother to score many have set criteria half as strict as the ill designed and now embarrassingly withdrawn American Smart Choices program. 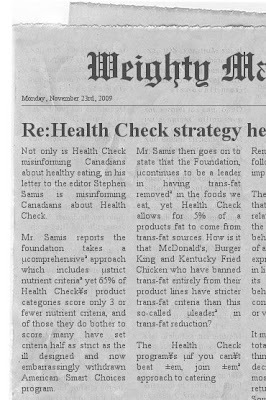 Mr. Samis then goes on to state that the Foundation, “continues to be a leader in having trans-fat removed” in the foods we eat, yet Health Check allows for 5% of a product's fat to come from trans-fat sources. How is it that McDonald's, Burger King and Kentucky Fried Chicken who have banned trans-fat entirely from their product lines have stricter trans-fat criteria than this so-called “leader” in trans-fat reduction? The Health Check program’s “if you can’t beat ‘em, join ‘em” approach to catering to Canadians who choose not find the time to cook from scratch and its endorsement of highly processed boxed foods along with its lax and sparse nutrient criteria does a tremendous disservice to Canadians and is an affront to evidence based nutrition. The Heart and Stroke Foundation and Mr. Samis would be far better off spending their time dismantling this plodding, half-baked initiative rather than defending it.